Exploring Autumn decor outside of our regular comfort zones was so much fun. After having visited the web-shop of ZooKshop designs, we immediately had to share, just our favorite display. If this is too colorful for you, enjoy a visit through this unique decor store for an array of various intensity hues. There is an abundance of tastes on display! This (large) single Fallow Antelier is adorned by triangles, shapes. Paints of blue green hues, grey ivory teal blends and combined colours; expressing perfectly positioned traditional patterns and design. The captivating piece, has been painted with soft matte paints in shades of vivid teal, bright turquoise, soft pale dove-grey, and smokey grey. 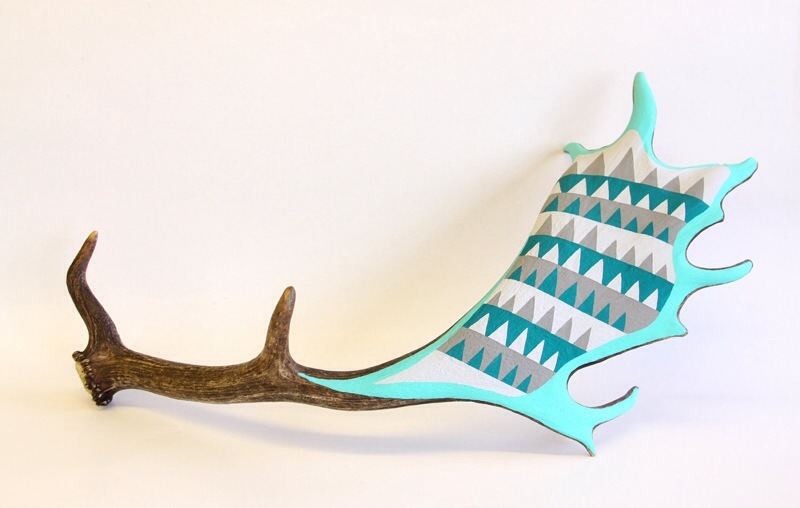 Leaving the base of the (antler) bare, offers a clearly appreciated contrast against the paintwork and materials. Simple items transformed into works of art, after being hand-painted with special treatments and care by their curator, Zook. A truly unique collection of bar-raising multi-coloured figures all available from the ZooKshop design studio. 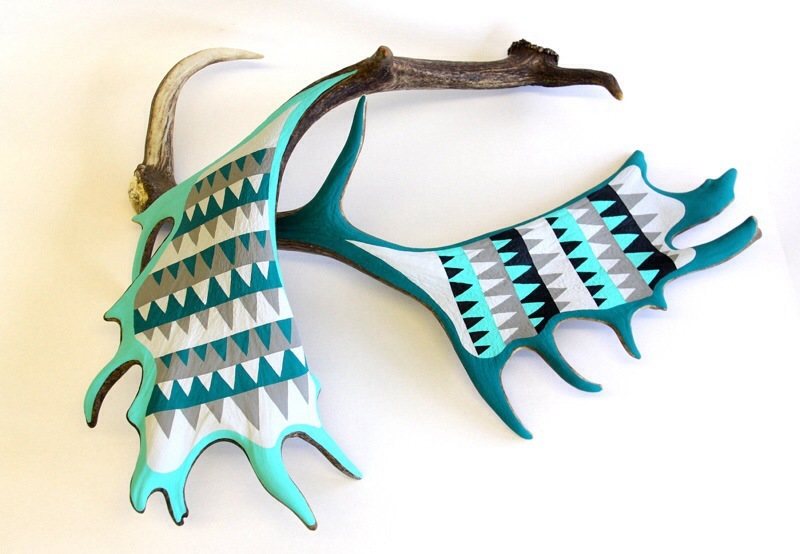 large bold painted antler decor – brighten up! An art teacher by day, whom utilizes spare time to unleash her own artistic abilities through these designs, in moments of the weeknights and weekends. Zook exposes the bold, bright, characteristics of these (already) unusual pieces of decor, adding enthusiasm through triangles, geometric patterns and meaningful shapes. The passion emanates her fervor and honesty, into each one-of-a-kind sculpture through to your space. ZooKshop is a studio encouraging your personal creativity to flow through your next interior adventure. Make it colourful! Make it a fun one! 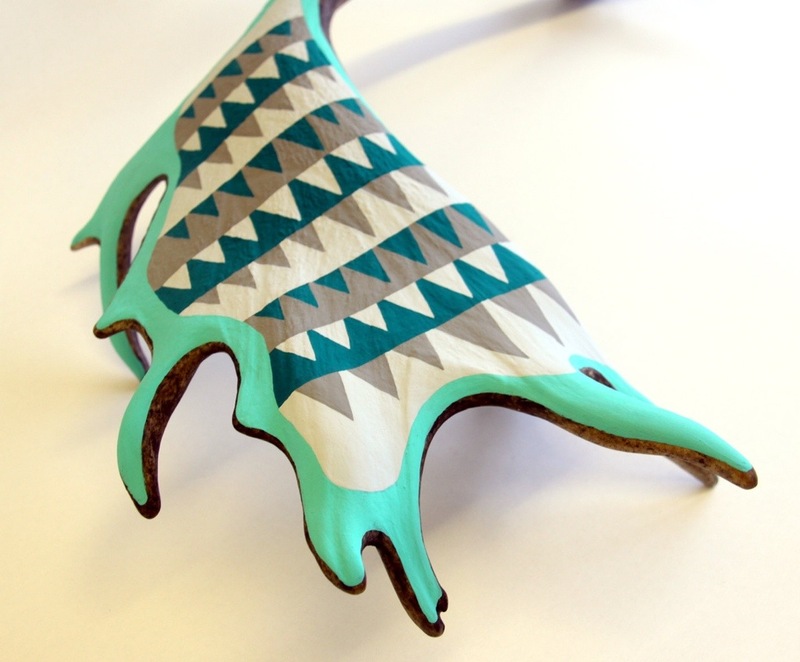 Bring your space design to life with the custom made assistance of ZooK, a caring, dedicated, and eccentric creator herself, exuding great zeal for her life’s art. For personal colour choices, suggestions, and inquiries contact the designer here under Contact. Our Designed Opinion is explore all of the colourful pieces available for purchase, at ZooKshop, while on a hunt for a statement piece, or focal point in your next home decor project. ‘Like’ ZooKshop on Facebook, for updates and everything in between! *All images used with written artist permissions. All copyright laws apply to reproduction; contact designer for more.